Explore un mercado local en Cusco, luego tome un taller sobre cocina peruana durante esta experiencia culinaria de 4 horas. 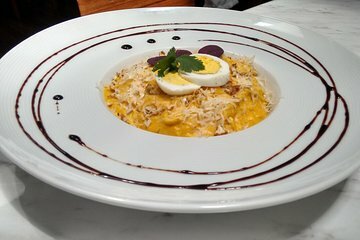 Conozca las funciones de las cocinas tradicionales andinas y las especialidades locales de un chef peruano profesional. Degustaciones, comidas y bebidas incluidas. Clase de cocina de 4 horas y visita al mercado en Cusco. Dirigido por un chef profesional. Horario de almuerzo o cena. Aprende sobre los productos tradicionales peruanos en el mercado. Cocina el almuerzo o la cena en la clase de cocina, luego disfruta de la creación. Degustaciones de pisco y chica. Elija la hora del almuerzo o la cena (9 am o 3 pm) al hacer la reserva. Reúnase en el Mercado Central de San Pedro, la ciudad más grande y popular, llena de productos locales de todo el Perú. Aprende sobre las variedades endémicas de papas y maíz comúnmente utilizadas en la cocina peruana. Comience su clase de cocina con una lección de pisco sour, la bebida nacional del Perú. Aprenderás a hacer esta famosa bebida nacional peruana y también a probarla. Posteriormente, comenzaría su experiencia culinaria. Dependiendo de su elección de almuerzo o cena, prepararemos algunos platos peruanos tradicionales, con un toque moderno, siempre guiados por nuestro chef peruano. Para poner la cereza encima del pastel, el último paso de la clase será un postre peruano típico, donde degustaremos algunas de las frutas más exóticas del Perú. My daughter and I had a wonderful time with Jesus. He took us to San Pedro Market and showed us around the market while he bought food for our cooking class. Then we walked back to his cooking studio and we made Pisco Sours, three kinds of ceviche, quinoa tamales with cheese, potatoes and vegetables and this amazing dessert with lucama and cherimoya. It was my daughter's favorite part of all of Peru! This was fun, but the description doesn't encompass everything. Incredible! Great tour of the market with samples of local eats. The food recipes were easy to follow and delicious! I look forward to recreating they at home for friends and family. Coveted everything from a classic take on a Pisco cocktail to local fruit dessert. The best class I’ve taken abroad. Chef Christian was by far one of the coolest people I met in this trip. Our first stop was el Mercado San Pedro, Cuscos main market. A must visit if you are curious how locals get their groceries and other goods! Then we prepared multiple Peruvian dishes with the ingredients we got at el Mercado San Pedro. Such as, Ceviches, tiraditos etc. Easily one of my favorite things I did in Cusco!! Great experience. Tour and chef itself was great. Only negative side was from Viator, since online it says that Lomo Saltado would be main dish for dinner and cerviche for lunch. I booked dinner and we prepared cerviche instead of Lomo Saltado. It tasted great and was fun including chatting with the other couple in our class, but mildly annoyed regarding Viator's false advertising. The chef was great and very likeable and the time in the market was fun. Unfortunately I found this tour to be too long. 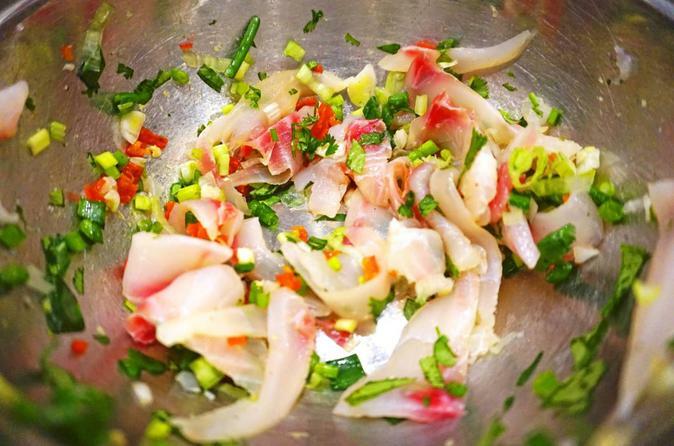 From start to finish, it was about 5 hours and most of the time was spent making a pisco sour and ceviche. The ceviche was frozen. I did not feel like we learned any real cooking techniques that we could take back home. The chef seemed to do the majority of the techniques while we we just stirrers and slicers. By the time it was over, we were soooo ready to bounce. The picture in the ad for this was nothing like what we made. We also don't know what happened to all the extra food. This was an excellent experience. All of the dishes we prepared were recognizable on menus the rest of our stay in Peru. Highly recommended way to start your stay in Cusco after long travels.